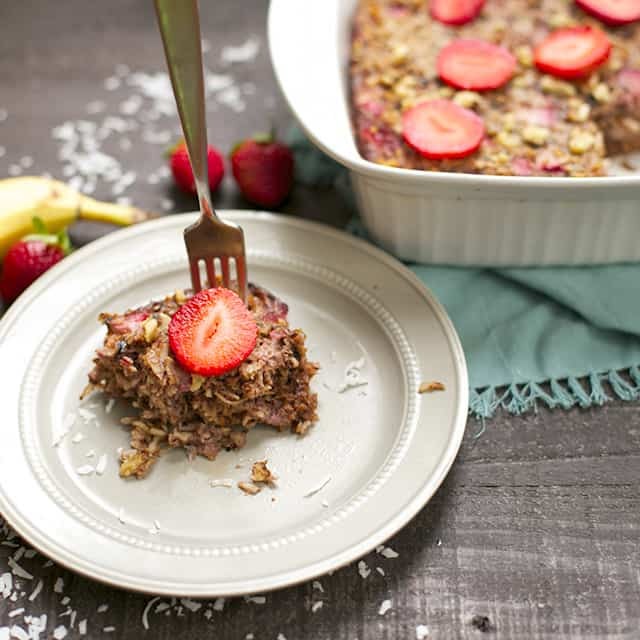 This Strawberry Coconut Breakfast Bake is reminiscent of baked oatmeal, without the grains! 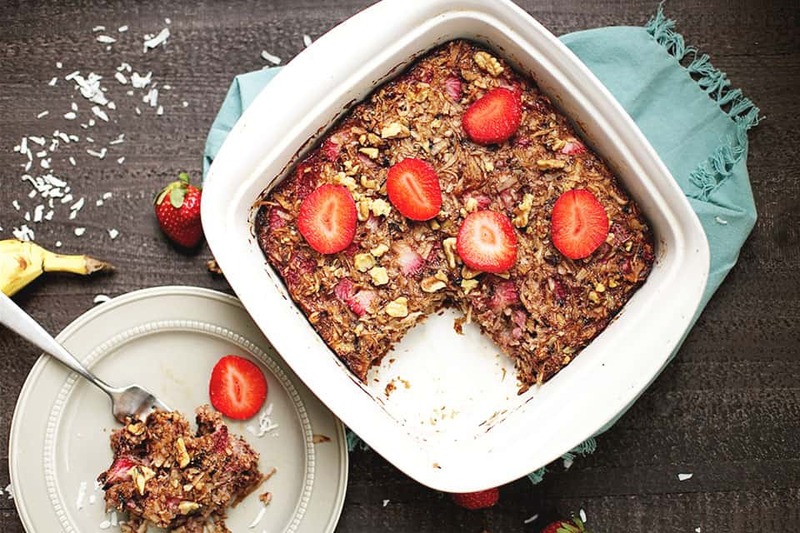 You’ll love this healthy and delicious alternative to traditional hot breakfasts. Paleo and grain-free! 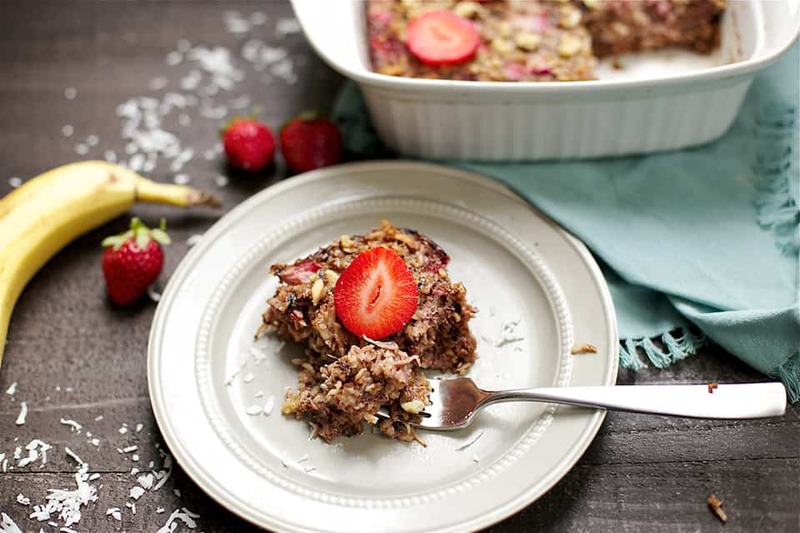 Strawberries, coconut, bananas, walnuts, chia seeds, and a dash of cinnamon flavor up this yummy breakfast that is kid approved! You guys, I can actually get on board with a breakfast that is not eggs or a protein shake!!! I am kind of excited about this 🙂 I have been playing around with some flavors of these N’Oatmeal breakfasts, and super happy with this dish! I’ve had a few clients ask me recently for healthy breakfast ideas that don’t include eggs as the main dish or grains. I set to work with something hot, easy, and yummy! 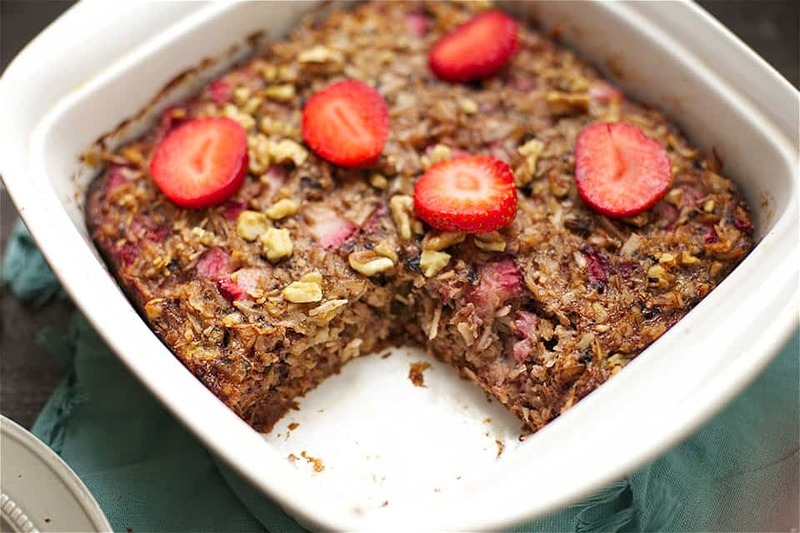 This breakfast comes together by combining some eggs with nut milk, to give it a baked oatmeal type texture. The shredded coconut, walnuts, and fruit are the star! 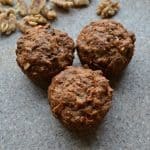 What I love about this recipe is that it is packed with healthy fats and only sweetened with the fruit. You can feel free to drizzle a little honey or maple syrup, but totally not necessary! So I have to be completely honest with you, and let you know of a not so funny story today that involves this breakfast. I actually ate this for dinner. Why is that? Because my 75lb lap dog Briard puppy, thought it was a great idea to completely devour an entire sheet pan dinner that was sitting on my kitchen table (my counter height kitchen table I should add). She did all of this while I was picking my kids up from school. You can imagine how mad I was to find my beautiful dinner GONE!!! Luckily, I made this earlier today and had something else to enjoy. While I wouldn’t necessarily recommend this as a dinner food, it was satisfying enough to keep us happy. My kids are even looking forward to eating it tomorrow morning! Preheat your oven to 350 degrees. Grease an 8 inch square pan and set aside. In a large bowl, mix together your dry ingredients: coconut flakes, walnuts, chia seeds, cinnamon, baking powder, and salt. In a smaller bowl, whisk together eggs and milk. Now add in coconut oil and mashed banana. Add wet ingredients into dry and mix well. Bake for 40-45 minutes, or until top is firm and golden. *You can feel free to add in a drizzle of maple syrup or honey for an added sweetener. 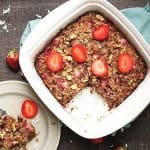 Can I make this without the chia seeds? Can I sub flax Seed? Hi Jenn, you can omit the chia seeds without a problem! Substituting flax seed is not necessary, but go for it if you want the boost of Omega 3’s! Is it possible to get the nutrition info? I’d like to see them too. 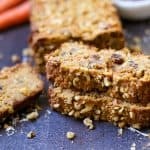 Can i use coconut milk in place of nut? Yes, absolutely. I will keep this in my fridge for up to 5 days and re-heat each morning. What was the purpose for the coconut oil? I made this & found it was very oily in taste & texture. I even cut down on the amount of oil than what the recipe called for. Hi Jas, the coconut oil helps to toast everything and also help to bind once refrigerated. I have made this many times and enjoy it much better with the oil. Sorry you didn’t have a good result. Hi, I’m on the keto diet and can’t have bananas, any other suggestions? Hmmmm….The banana is mostly there to offer natural sweetness, and a little bit of a binding agent, so that makes it tough. You could try omitting altogether. Recipe won’t be very sweet, but still tasty. If you could add a tad bit of real maple syrup that would help. How about canned pumpkin? That might work instead of bananas; which I think have an over powering flavor. Great recipe! Thanks for sharing. I agree that banana can be overpowering, so I substituted 1/3 cup pumpkin & 1 Tbs honey. I know the honey might not fit some special diets, but it worked well for me & was very tasty. What about adding dates in place of the banana. It’s moist and sweet. You can try that, it might change the texture a bit. I don’t see the chia seeds in the instructions. Do you soak them and add as a wet ingredient or put them dry into the dry ingredients? Thanks. Chis seeds still not listed under dry ingredients, over a year later. I came here to double-check myself. Thank you. They are listed under the dry ingredients section. May I use frozen or thawed strawberries? I haven’t tried with frozen, but it should work as long as you drain the liquid. The reason I don’t use them is that cutting thawed strawberries is pretty difficult. But you could even puree them instead of dicing strawberries. MAy I use frozen or thawed strawberries?? Sure, pecans would work great! I made it with pecans and it was fabulous! I made this and it smells amazing and takes great. My only issue is the coconut flakes are hard and chewy. I used organic unsweetened flakes. Would shredded coconut work as well? I was not a fan of all that hard chewing LOL. Hi Heather, yes you can absolutely use shredded coconut (unsweetened). I am more of a crunchy texture, but the shredded coconut would work well too! Do you think this will freeze well ? The top cooked well, but the inside is so mushy and oily. 🙁 Definitely doesn’t look as well binded as yours! I’ve done 40 and 45 minutes – going to see if more time will dry it out. Hi Kelli, it might need to cook longer. Let me know how it turned out! Hi!! Yours looks so perfect and granolay. Mine looks like oily mush and I even cooked it for 60mins. Any suggestions on how to get it better? Sorry about that! Mine worked great in a smaller pan, but perhaps spreading out thinner over a larger pan would work? You could also try decreasing the coconut oil to 2 tbsp next time to dry it out a bit. Hope that helps! It’s a great recipe, I’m taking it to a work potluck breakfast. Thank you!! Great Lucy! Love the addition of chocolate chips! What about coconut milk instead of nut milk? thank you! So glad you loved it! I am thinking it would be fine, but never tried it that way! Let me know how it turns out if you do. Can I substitute unsweetened applesauce for the eggs to make it vegan friendly? Hi Ashley, I am not sure because the egg really binds the dish together. I think it would be a more runnier consistency. I would maybe try a 2 flax “eggs”, and then a bit of applesauce. Hi can’t wait to try this!!! What is considering 1 serving size?! I want to make sure I portion it correctly! Hi Jess! A portion size would be 1 square, about a 2×3 inch square. The recipe should be cut into 6-8 equal pieces. Hope that helps! Hello. I found this just by chance. I saw shredded coconut in our pantry and looked up something for breakfast. Sounded good so I had to try it. I did however make a change. We have a small farm with goats so I used the goat milk instead of nut milk. And of course we have chickens so fresh eggs as well. Let me say we loved it, even the picky eater liked it. Thank you for sharing. We will be making this again. That makes me so happy! Your changes sound perfect, so glad you all loved it! I must have done something wrong. My family all took one bite and spit it out. They thought it was disgusting. I love all the ingredients was excited to try it. It is so bitter and mushy.Suggestions? I am going to try it using chia eggs. This was delicious! Very simple to make, and so tasty. Thanks for the amazing recipe! Do you have the nutrition facts for this meal? No, sorry I don’t post nutrition facts. You can find the nutrition facts on several websites or apps like myfitness pal. Based on some of the other comments, I made some minor tweaks. I used about 3/4 cup of coconut milk (I didn’t have any nut milk) and decreased the coconut oil to 2 tablespoons. This turned out great and I will definitely make this again! Looking forward to making this! Looks yummy! If it helps any, this is the Paleo recipe I use for baking powder: 2 parts cream of tartar, 1 part arrowroot or tapioca starch, 1 part baking soda. Thanks again for sharing such a yummy recipe! Does this need to be refrigerated after it cools? Yes, because of the eggs! Hi there! This looks so yummy, and I can’t wait to try it. 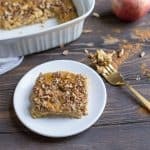 Is there an alternative I could use instead of nuts? I saw you suggested pecans instead of walnuts in a previous comment, but I’m wondering if there is something else I can use instead of nuts all together? Thanks! Hi Kyleigh, you could try coconut flour? It will definitely change the texture to more mushy as the nuts give the recipe a crunch. Hi Amy, allergies here, too…but I can eat sunflower seeds…maybe I’ll split the difference between coconut flower and sunflower seeds. Any other substitutions you might recommend for nut free? Can you put this together the night before, and bake it the next morning? I have not tried that before. It might Change the texture a little, so would require a longer baking time. Made this for a work pot lock today. Was pretty good..I doubled the recipe but only had about 2 cups of coccunt but it turned out to be plenty. Added a little extra chia seed And nuts decreased oil to compensate for decrease coccunt…. I’m not Paleo, but recipe looked delicious and it turned out great! Served as a dessert with a side of vanilla ice cream. Hi Kate, I agree. I initially made this over a year and a half ago, (not during a round of Whole30 for me), and wrote that it could be Whole30 compliant in my blog post. Now that I know better (that it is NOT Whole30) I do not promote it that way (nor have I promoted it that way for over a year), only that it is Paleo or healthy breakfast option! I will read over my initial comments in the blog post about this and change any wording that is misleading people to that way. I still enjoy this breakfast and think you would too if you try it! Thanks for stopping by. Hi. How long would this keep in the fridge? 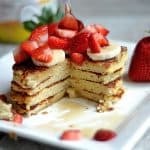 I am looking for me make ahead breakfast and I would like to give this recipe a go but would love to know how long I can keep it for. It will definitely last 3-4 days. I wouldn’t keep much after, but you can also freeze! Is there a difference between regular BP and Paleo/Whole30 BP? Baking powder is not Paleo or Whole30. Wow!! Amazing!! I had to make a few changes because its what I had on hand. I used sliced almonds and not walnuts. I used coconut milk, and I used sweetened flakes (yikes, but it could be worse, I could be eating biscuits and gravy haha) Sharing this with friends!! I didn’t find it to be to overpowering with the coconut flavors. It was perfect! Thank you so much! !